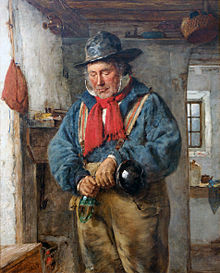 Erskine Nicol RSA ARA (3 July 1825 – 1904) was a Scottish figure and genre painter. He was born in Leith on 3 July 1825 the eldest son of James Main Nicol and his wife Margaret Alexander. After initial apprenticeship as a decorator he turned to art. He was a student at the Trustees' Academy, Edinburgh, where he studied with Sir William Allan, and Thomas Duncan. On qualifying he initially taught as an Art Master at Leith Academy. Nicol taught in Dublin, Ireland, from 1845–50, at the height of the Irish famine, and identified with the oppression of the Irish people and much of his work portrays the injustices inflicted upon the Irish population during the 19th century. Nicol exhibited at the Royal Academy and was made an Associate of the Royal Academy in 1866. He also exhibited at the Royal Hibernian Academy and the British Institution. In 1862 he left Edinburgh and moved to St John's Wood in London, then in 1864 moved to 24 Dawson Place in west London. He also purchased a studio in Clonave in County Westmeath in Ireland and enjoyed finishing canvases there until ill-health forced him to curtail his travelling. He thereafter used a disused church in Pitlochry to complete his works. He died at The Dell, Feltham, on 8 March 1904. He is buried with his second wife in Rottingdean. In 1905 the Royal Scottish Academy held a commemorative exhibition. ^ a b c d e Meldrum 1912. ^ Erskine Nicol Contemporary Irish Art Archived 6 February 2007 at the Wayback Machine. Retrieved 4 September 2007. This article incorporates text from a publication now in the public domain: Meldrum, David Storrar (1912). "Nicol, Erskine". Dictionary of National Biography (2nd supplement). London: Smith, Elder & Co.
Wikimedia Commons has media related to Erskine Nicol. This page was last edited on 25 January 2018, at 17:21 (UTC).